One of the unique aspects of becoming a part of the SUNY Potsdam Graduate community is the emphasis on experience, not just on your intended degree. At SUNY Potsdam we believe that your journey to continue your education should motivate you to succeed as a student as well as beyond the walls of the university. Explore the SUNY Potsdam Difference online and in within the viewbook below. Rigorous: Each curriculum is designed to familiarize you with the technical background, pedagogy and the current demands associated with your chosen degree program. Experiential: Your existence as a learner will extend beyond the classroom. You will have unlimited support while a student as well as an alumni. Personal: Access to faculty is our strength. Enjoy smaller classes and an individual approach to your education. Flexible: Graduate course schedules are uniquely designed to work for you by offering course formats that will fit into your busy schedule. 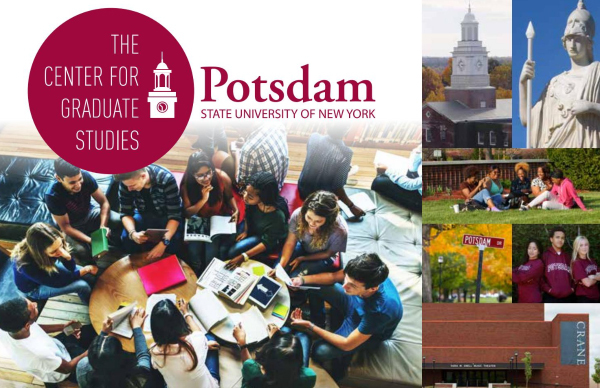 Affordable: SUNY Potsdam considers your education as an investment. With graduate programs that are less costly than what you would expect to pay for such highly regarded degrees.